We’d love your help. Let us know what’s wrong with this preview of War of the Gods by Poul Anderson. The story of the great King Hadding is one of the darkest and most violent to come down to us from the old North. Hadding was raised by giants far from his rightful throng, as his father, a Danish King, was slain shortly after Hadding's birth. But the times comes when Hadding feels he must reclaim his legitimate place in the land of the old North. He must endure ferocious The story of the great King Hadding is one of the darkest and most violent to come down to us from the old North. Hadding was raised by giants far from his rightful throng, as his father, a Danish King, was slain shortly after Hadding's birth. But the times comes when Hadding feels he must reclaim his legitimate place in the land of the old North. He must endure ferocious battles, the charms of voluptuous Valkyries, and a War of the Gods to rival Armageddon. To ask other readers questions about War of the Gods, please sign up. A monumental effort: to create the saga of a heroic king who may or may not have actually lived, drawn on one admittedly poor source. (But others have done more with less creating a historical Arthur from Gildas' sixth-century "Ruination of Britain.") Shades of The Silmarillion, and like it not as successful as one would hope/expect. My chief quibble is that I never felt an emotional connection to the protagonist. It was all about as interesting as reading a history book, or one of the Middle Ear A monumental effort: to create the saga of a heroic king who may or may not have actually lived, drawn on one admittedly poor source. (But others have done more with less creating a historical Arthur from Gildas' sixth-century "Ruination of Britain.") Shades of The Silmarillion, and like it not as successful as one would hope/expect. Huvitav raamat mitmes mõttes. Pealkiri lubaks justkui mingit suurt üleloomulikku jumaliku elemendiga sõda aga tegelikult on see hoopis ühe saaga ümberjutustus. Kohati on saaga isegi pisut veniv lugu Taani viikingkuninga elust ja pidudest. Jääb mulje kohati, et taanlane jõudis elus edasi peamiselt tänu kahele asjale a) ta oli pagana osav kaotatud lahingutest jalga laskma b) üleloomulikud sõbrad. Lõpp mulle samas meeldis ja andis kõvasti üldhinnangule juude samas. Spoiler! Tuli välja, et kogu lugu Huvitav raamat mitmes mõttes. Pealkiri lubaks justkui mingit suurt üleloomulikku jumaliku elemendiga sõda aga tegelikult on see hoopis ühe saaga ümberjutustus. Kohati on saaga isegi pisut veniv lugu Taani viikingkuninga elust ja pidudest. Jääb mulje kohati, et taanlane jõudis elus edasi peamiselt tänu kahele asjale a) ta oli pagana osav kaotatud lahingutest jalga laskma b) üleloomulikud sõbrad. Lõpp mulle samas meeldis ja andis kõvasti üldhinnangule juude samas. Spoiler! Tuli välja, et kogu lugu oli viikingi versioon Põrgupõhja uuest vanapaganast !spoileri lõpp. Käis kah ühesõnaga. This was certainly decent, but not up to the quality of the Last Viking series or Hrolf Kraki's Saga. This should probably be at least 3* as the writing is ok. Fantasy / mythology with magic and swords just isn't my thing. But I've started to read Poul Anderson as I've hears so many great things. Never did really care about what the characters were trying to do or accomplish, so just abandoned after about 100 pages. Just felt like Tolkien wanna-be type of story that really didn't come close to pulling it off. Quite few years ago now, I read Anderson's Broken Sword and immediately fell in love with his handling of Norse, Germanic and early British mythology and lore (using much of the same material Tolkien used, at just about the same time, but simultaneously ever so differently). As a result, I've picked up a few other books by him in the years between then and now, though they have, for one reason or another, been standing on the shelf unread. 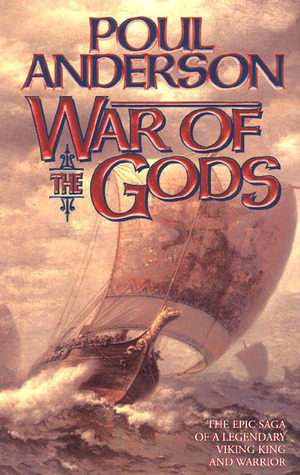 Finally deciding to take War of the Gods off the shelf re Quite few years ago now, I read Anderson's Broken Sword and immediately fell in love with his handling of Norse, Germanic and early British mythology and lore (using much of the same material Tolkien used, at just about the same time, but simultaneously ever so differently). As a result, I've picked up a few other books by him in the years between then and now, though they have, for one reason or another, been standing on the shelf unread. Finally deciding to take War of the Gods off the shelf recently was indeed a good idea. While Anderson's retelling of the story of King Hadding's life clearly ties in with mythology and has some fantastical elements in it and around it, there is less of those elements permeating the story on the whole than say in Broken Sword. This, however, is certainly no flaw in the story, which is a well told saga about a Norse king, who after having been fostered by giants, living on the rim of human existence as it were, has a few more supernatural or mythical encounters in his long life, but more than that leads an adventurous and prosperous life as king of the Danes. Anderson's vocabulary and literary style bring the old texts of the Vikings to mind and creates a marvellous sort of verisimilitude that draws you right into the story. I wasn't sure whether to rate this lower or higher. It's not a perfect book, there are some strange mistakes for a veteran writer such as going back and forth in the timeline of a plot when one could have just as easily done everything for a certain time at once and perhaps accomplished things better, but for the most part I enjoyed this book. Much fantasy is influenced by Norse mythology, but Poul Anderson is one of the very very few to actually use it in his fiction. Somehow, he's able to write I wasn't sure whether to rate this lower or higher. It's not a perfect book, there are some strange mistakes for a veteran writer such as going back and forth in the timeline of a plot when one could have just as easily done everything for a certain time at once and perhaps accomplished things better, but for the most part I enjoyed this book. Much fantasy is influenced by Norse mythology, but Poul Anderson is one of the very very few to actually use it in his fiction. Somehow, he's able to write stories that feel more original, closer to the source if you will, then some fiction that had come before. There's a lot to get from a book like this, where early viking culture and daily life is displayed. Sometimes the plot could get dull. I felt like it was too episodic in nature. There wasn't really any single point of climax which is strange, but Anderson was after all basing this off of an older, independent myth so I would shy from blaming it all on the author. The book did, however, tend to meander in it's self a lot, but I for the most part enjoyed Hadding's adventures and loved seeing the combination of viking Europe connected to viking mythology. Poul Anderson takes some norse myths and tries to fashion them into a novel, with only luke warm results. Despite the change in format, this doesn't read like a novel. It still reads like a myth and it doesn't quite work at this length. It gets very dry and even with all the fantastic elements the characters stay fairly flat. Interesting, as it was covering myths I wasn't familiar with, but there was no extra spark here. I could have gotten the same feeling story if I'd just bought a book of norse Poul Anderson takes some norse myths and tries to fashion them into a novel, with only luke warm results. Interesting, as it was covering myths I wasn't familiar with, but there was no extra spark here. I could have gotten the same feeling story if I'd just bought a book of norse myths. I was really hoping for more then I got here. When you know little about a subject it's always nice to find something which excites your curiosity to know more about it. This happened to me with this book, though all I found out about this king (since yesterday) is greatly involved in myth which makes it harder to create a clear image of the man behind it. However with or without the myth it seems to me like he was a great leader, and this work of fiction, despite its obvious fantasy, shows you that. Recommends it for: Anyone who loves mythical tales. I think this is a brilliant reinvention of the Norse myths. It was a great way to bring it to life and maybe understand how myths might have actually been told when the Viking culture passed these tales down through a verbal tradition. I am also a huge fan of Smiley's "The Greenlanders", so that might help you understand my interpretation. I remember really liking this book when I read it in high school, but when I went to add it, the book description didn't match the things I remembered so I had to actually track down another copy to confirm it was the same book that I had read. That is probably as telling as the fact I liked it originally. If you're interested in Norse mythology, I would probably recommend it. I probably should have read this book several years ago as Anderson uses archaic language in the book which makes it rather difficult reading as I'm now used to the more "modern" language that all authors use. Still, it was an interesting book that deals with a relatively obscure historic individual - King Hadding the Dane. This is probably not for everyone. The story is a ancient tale that the author fleshes out to make a memorable story. As always, Poul Anderson's writing is impeccable. The characters in Anderson's fanatasy that I have read tend to be brutal, not all of them, but the ones that are do so with zeal so read with caution. I started it, and the mythology was interesting, but at the time I wasn't looking for something with a more mythological storytelling style. I wanted a more straightforward narrative. Maybe I'll pick it up again some time. The story of Hadding, the Viking king. Fostered as a baby to a giant's family to protect him from his father's slayer, he returns to the Danes as a young man to avenge the deaths of his father and half-brother. This is the story of his adventures. I highly recommend this book if you are a lady jotun hankering for a brief, sad love story. If you've even a vague interest in Norse mythology, you must read this. It may very well help you understand the subject in a way you never have before. Another of his Norse myth retellings. He's good at it.